Bond no. 9's flagship boutique, at the company's namesake address, is located on a cobble-stoned street with historic cast-iron architecture. 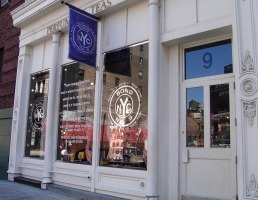 Walking into the boutique, you may be impressed by its sheer size; in this city where real estate is an obsession, charted inch by costly inch, Bond occupies the entire first floor of the building. Everywhere you turn in this shop, there is something colorful or glittering to see. Amphora-like dramming units are displayed on mannequin-shaped stands; refillable atomizers are arranged in the slots of a votive-candle stand salvaged from some unknown church. In addition to the more than thirty New York-inspired fragrances (most of which are Eau de Parfum), you can cast your eye (and nose) over scented body creams, candles, soaps, and limited edition bottles encrusted with Swarovski crystals. 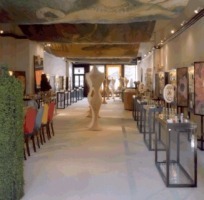 Due to the boutique's expansive space, the ever-growing product line, the somewhat repetitive display groupings of Bond's signature star-shaped bottles (you might find yourself struggling to locate a fragrance you have in mind, while other fragrances seem to appear more than once), and the visual stimuli of floral arrangements, mirrors, a case of antique perfume bottles, giant reproductions of nineteenth-century paintings, and so on — you may experience some sensory overload. Fortunately, the rear area of the boutique includes a seating area of low couches and chairs where you can peruse (and then purchase) a copy of Michael Edwards' Fragrances of the World or New York by Tama Janowitz and Kanjii Ishii. Finally, this location of Bond no. 9 is usually more than adequately staffed, so you shouldn't have any trouble finding someone to help you if you have questions. If you do choose a fragrance for yourself, you'll be handed a heavy white-and-gilt shopping bag containing your smartly boxed purchase and most likely a few samples of other fragrances to try. Not to be missed: Travel-sized atomizers ("Bon-Bons") wrapped in colorful foil like pieces of candy, and solid-perfume compacts that resemble oversized subway tokens.